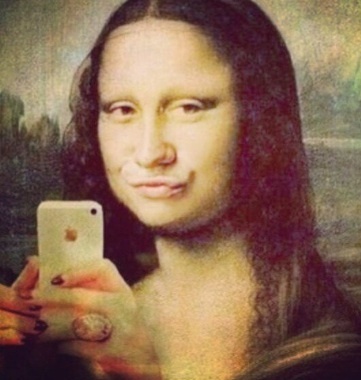 Although the duck face is a fairly new trend, artists have been creating "selfies" since paint was invented. Back then they were called self-portraits. Some people see the selfie trend as a reflection of society's growing selfishness or as a way to judge one's own popularity. They also record life events, as well as, document the way we live and who we are. For this project you will be creating a work of art centered around who you are, how you feel, and your own personal culture. First, you will take a selfie that will be printed out (black & white or color). The selfie will be used as part of a mixed media collage. To begin, brainstorm some ideas about what you would like to include in your selfie that expresses who you are. Below is a list of things that may be included. Your selfie will be glued down on your paper. Only part of your face may show. Use paint, magazine images, drawing, marker, etc. to add color and design. Limit your ideas and colors. You don't need to include every part of your life. It is better to just include a few important things. Below are some examples of art that include a selfie. Take a PHOTO of your finished work and turn it into SCHOOLOGY under Who Am I Collage PHOTO. Show your art to 3 other people and ask them if you need to add or fix anything in your work. Look for areas that feel empty or stand out as not belonging. Clean up any messy areas. Click on the button below and down load the Rubric PDF. Annotate on all 3 pages and upload the rubric to SCHOOLOGY under Who Am I Collage.